Wearable/Art/Signature Scarf includes fabric pens. Use for get well messages or designs. Scarf n' Cap great for a bad hair day! L' Escarfe' slip on scarf ....fast and fabulous. So shall My word be which goes forth from My mouth; it shall not return to Me empty, without accomplishing what I desire and without succeeding in the matter for which I sent it. For you will go out with joy, and be led forth with peace; the mountains and the hills will break forth into shouts of joy before you, and all the trees of the field will clap their hands. Instead of the thorn bush the cypress will come up; and instead of the nettle the myrtle will come up; and it will be a memorial to the Lord, for an everlasting sign which will not be cut off. He therefore began saying to the multitudes who were going out to be baptized by him, "You brood of vipers, who warned you to flee from the wrath to come? Therefore bring forth fruits in keeping with repentance, and do not begin to say to yourselves, 'We have Abraham for our father,' for I say to you that God is able from these stones to raise up children to Abraham. And also the axe is already laid at the root of the trees; every tree therefore that does not bear good fruit is cut down and thrown into the fire." And the multitudes were questioning him, saying, "Then what shall we do?" And he would answer and say to them, "Let the man who has two tunics share with him who has none; and let him who has food do likewise." Again the next day John was standing with two of his disciples, and he looked upon Jesus as He walked, and said, "Behold, the Lamb of God!" And the two disciples heard him speak, and they followed Jesus. And Jesus turned, and beheld them following, and said to them, "What do you seek?" And they said to Him, "Rabbi (which translated means teacher), where are You staying?" He said to them, "Come, and you will see." They came therefore and saw where He was staying; and they stayed with Him that day, for it was about the tenth hour. One of the two who heard John speak, and followed Him, was Andrew, Simon Peter's brother. He found first his own brother Simon, and said to him, "We have found the Messiah" (which translated means Christ). He brought him to Jesus. Jesus looked at him, and said, "You are Simon the son of John; you shall be called Cephas" (which is translated Peter). "INSTEAD OF GIVING UP ON A PERSON, GIVE THAT PERSON TO GOD." This quote is from Our Daily Bread - July, 2004 Issue. Which disciple did Jesus find in Galilee? Thanks to Terri Kelly for her email about this pattern. I made a typo! For Round 2, I had typed "sc in ea dc" and it should have said "2sc in ea dc". how many chains to make at the end of the first row. Thanks to Bubbawubbee for asking about the Afghan Stitch. I've added more information regarding this stitch. I've also included more new information on the page. FREE SHIPPING with any order of $30 or more. Yo 5 times, insert hk in next st, yo, draw lp through st and all 6 lps on hk. Ch 1. This stitch has endless variations. click here for stitch photo and more information about this stitch. The bullion stitch can be made with a varied number of loops. The more loops you use the longer the stitch will be. Don't be afraid to change hook size in a pattern. Changing the hook size can alter the size of your finished project. try making the next one using a larger hook. Hello. I have just crocheted the sweater from your pattern online, and my beagle Princess looks adorable in it. I was wondering if you had any more designs? Thank you. I made the Broomstick Square and found no errors. The directions were easy to follow. I used a size 35 knitting needle for the broomstick and was able to easily block the piece to a 7-inch square. I plan to try again with a slightly larger dowel to see if I can get the lace a little "loopier". Thanks for making this pattern available. the Lord Bless You each and every day!!!! I really enjoyed browsing through your web site. You did a great job. I printed your pattern for the ripple rug. Am anxious to get started on it. It is nice to know there are other people who love to crochet too! Thanks for writing. I'm glad you enjoy my patterns and newsletter. I truly enjoy your site! It is very up lifting and a big help. 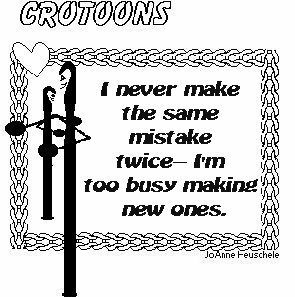 I look forward to a lot of great patterns and crocheting with all of you. identification and then give the password to the teller. her eyes and replied, "Save." I'd have to say it every time I make a withdrawal." when she spotted a cat crouched behind a bush. She watched the cat, and the cat watched the mice. Mother mouse barked fiercely, "Woof, woof, woof!" The cat was so terrified that it ran for it's life. "Now, do you understand the value of a second language?" I knew my career was coming to an end when my company sent me to Dr.
Kevorkian for my annual physical. hurry. Just pull the tooth as quickly as possible." dentist which tooth it is, dear." Because he didn't know if he'd be thirsty or not. settlement with your husband that is eminently fair to both of you." "Fair to both!?!" exploded Jill. "I could have done that myself. Why do you think I hired a lawyer?" A bride called to make a change to her wedding registry. bride wanted to change the dishes or the linens.